Here’s a Huffington Post article by Quinn Bradlee explaining his difficulties with bullying. Is the glass half full or is it half empty? It all depends on how you look at it. I’ve always had the ability to identify problems. This can be seen as a negative or a positive. In my life, it’s mostly been a negative. However, in the classroom, it’s definitely a positive. I can spend 5-10 minutes with a child and be able to tell you so much about them. People wonder how I’m able to do that! Well, it’s amazingly simple- Just listen! Children are amazingly self-aware. If you ask them, 9/10 times they will tell you what you want to know. Since I’m tired, I will not write a long drawn out post. I will simply wind this up. Being able to identify problems is a good skill to have, but it’s only half the battle. Now, since I’m the Inclusion Specialist at my school, I’m the one responsible for finding solutions. Believe me when I say that I’ve been working overtime doing just that. I’m all about the solutions. Now, in addition to finding problems, I’ve found that I also have the ability for finding solutions. It’s funny what you learn about yourself when you’re under pressure or you have to do what you have to do. One other problem I have the answer to is…Sleep! I’m on my way to bed! Goodnight! I don’t know why I’m so tired but I am, so I will post more tomorrow. Bye for now! Did you know that Steven Spielberg had dyslexia? Would you like to know how he handled it? Well, now you can with an exclusive interview w/Steven Spielberg by Friends of Quinn. When I began my M.A./credential program I had trouble distinguishing between phonological awareness & phonemic awareness. I thought the two were interchangeable. This is not the case. Although they are related, they are not the same. Basically phonemic awareness is an understanding of how sounds function in words. It’s the ability to manipulate sounds by adding and deleting letters while phonological awareness is the ability to recognize that words are made up of a variety of sound units- the basis of phonics. 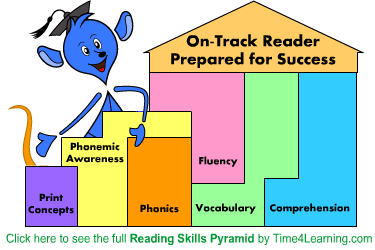 Here is an excellent Reading Skills Pyramid. If you click the link it’s more detailed. Very nice!